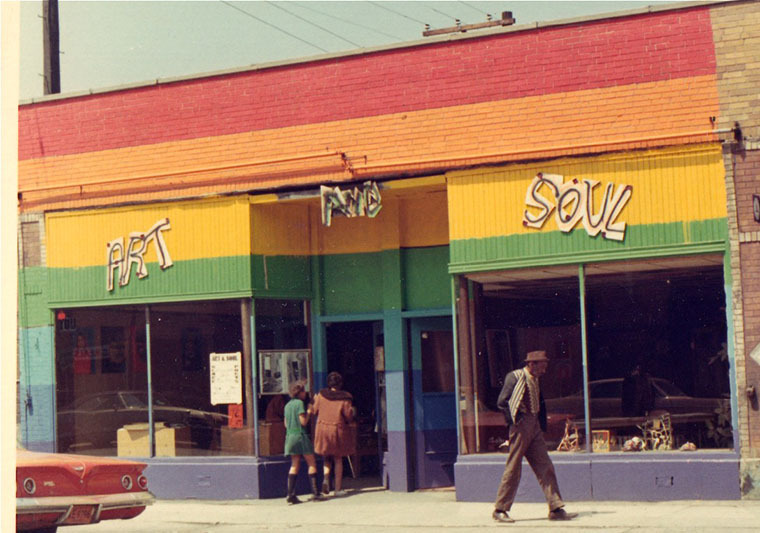 Art & Soul exterior with rainbow mural by Sachio Yamashita, 1969, Chicago. Mural artwork copyright: Eileen Petersen Yamashita. Photograph copyright: Ann Zelle. This book examines artists' collaborations across class, race, and geography in and around Chicago's Black Arts Movement (c. 1966–73), demonstrating the richness of the visual arts in this period of Chicago history and tracing the origins of today's "relational aesthetics" and "social practice" to the work of socially and politically engaged artists of the 1960s. Starring the Black Community details the commitment of African American artists of this period to engaging in a two-way dialogue with the community and the "street"—marginalized youth and youth gangs in particular. Rebecca Zorach is Mary Jane Crowe Professor of Art and Art History at Northwestern University. She teaches and writes on medieval and Renaissance art, contemporary activist art, and art of the 1960s and ’70s (particularly African American artists in Chicago). Recent articles have addressed AfriCOBRA's gender and family politics; Claes Oldenburg's lawsuit challenging the copyright of the Chicago Picasso; and the experimental art center Art & Soul. Her edited volume Art Against the Law (School of the Art Institute of Chicago and University of Chicago Press, 2015) addresses activist art in Chicago since the 1960s. She supervises a research project at the South Side Community Art Center, cataloging, presenting, and interpreting the Center's permanent collection. She has curated exhibitions on early modern European prints and printed books, and most recently AFRICOBRA: Philosophy at the Logan Center for the Arts.